The recipe for our Bodacious Apple Cheddar Dog Treats is here. Drizzle the swizzle! You can decorate any of our homemade dog treat recipes with our drizzle and festive sprinkles. It's super easy! Check it out right here. 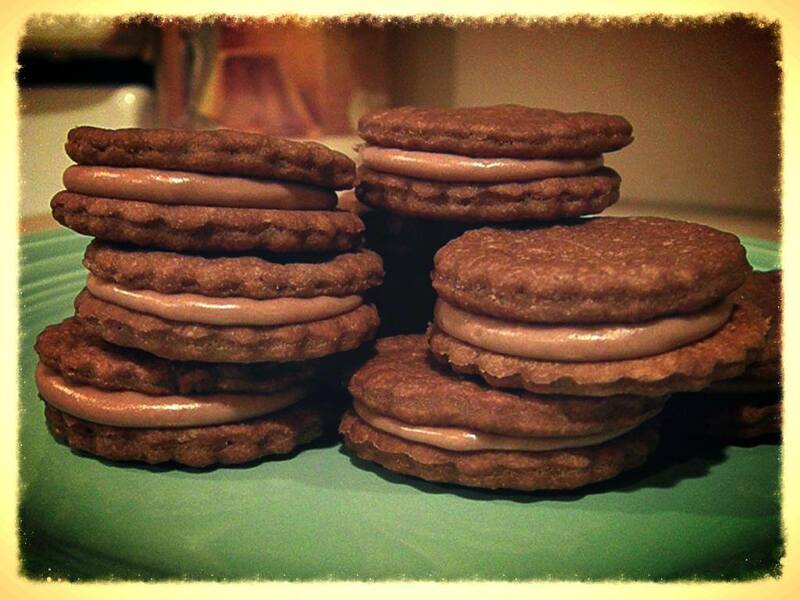 Your fur-kids can't have real chocolate, but they'll love these Double Carob Peanut Butter Sandwich Cookies. Here is the recipe! These homemade Peanut Butter Carrot dog treats are made with fresh carrots! 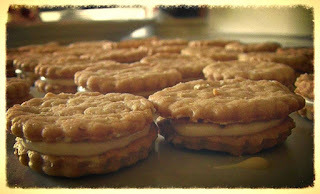 They're scrumptious and our kids were head over paws for these! We've got the recipe posted here. Our Bodacious Apple Pie Dog Treats are peanut butter free! Here's the recipe. 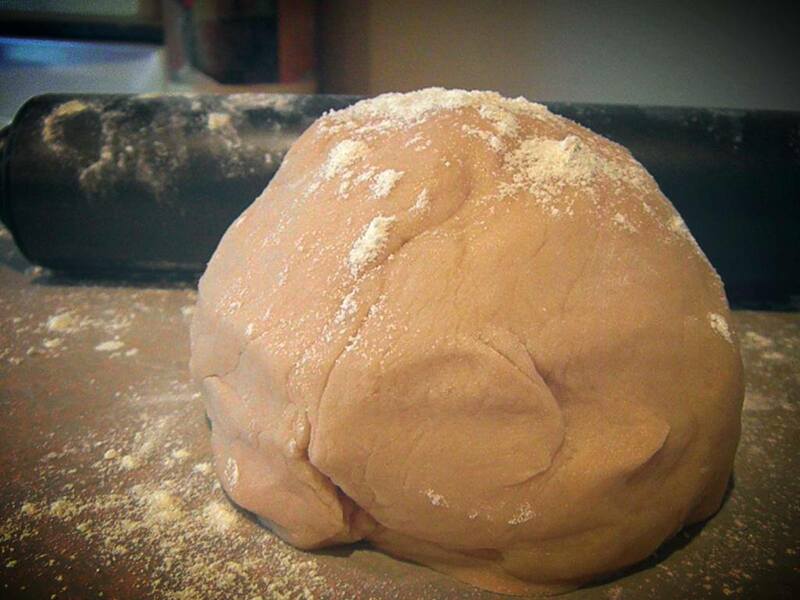 All of our homemade dog treats can be converted to soft baked treats. Here is how you do that in just 2 easy steps. Dried blueberries take center stage in these scrumptious soft baked Homemade Blueberry Pie Dog Treats. The recipe is posted here. I didn't think that fresh banana and grated carrots would pair well together, but I was wrong. The kids gobbled up these yummy homemade Banana Carrot Dog Treats..even Coco who is not a fan of bananas. Here is the recipe. For the first time ever, I created a savory dog treat recipe. 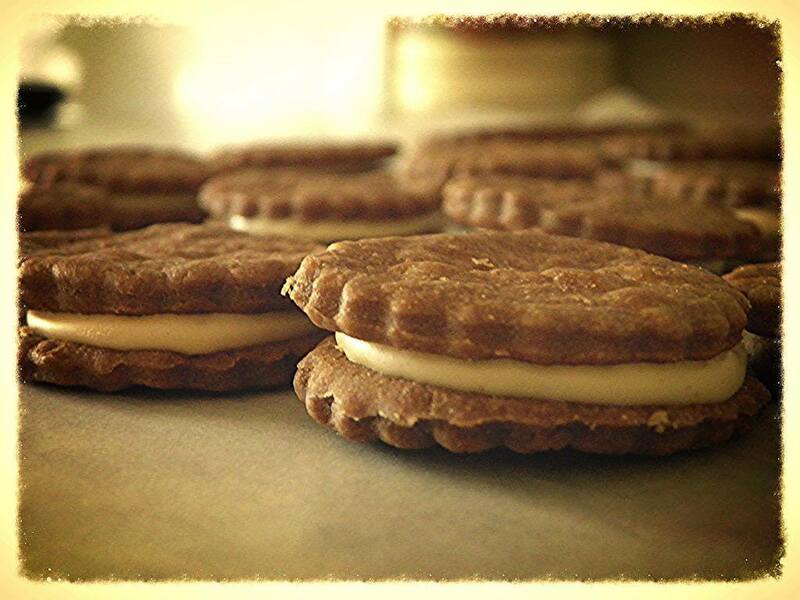 These smelled incredible when baking and our kids loved 'em! 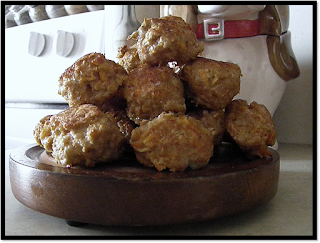 If you'd like the recipe for these Cheesy Sweet Potato Dog Treats, go here. With Valentine's Day just around the corner, I wanted to create a sweet treat that pups would be head over paws about. These Cranberry Crumble Valentine's Day Sandwich Cookies are peanut butter free and loaded with dried cranberries. I posted the recipe here. Not only did we step out of the box, we kicked the boxes to the curb when creating our Bodacious Turkey Veggie Meatball Dog Treats. Go here for the recipe. What happens if you don't have a rolling pin or cookie cutters? You can still make homemade dog treats. The recipe for these Yummy CranApple Carrot Gems requires no kitchen gadgets and they're loaded with fresh apples, carrots, and dried cranberries. Go here for the recipe. We had some bananas on hand and strawberries were on sale. I grabbed a few other ingredients and whipped up these yummy Bodacious Strawberry Banana Dog Treats. The recipe is right here. We've had a few requests for a peanut butter dog treat that didn't contain a ton of peanut butter. These Peanut Butter Banana Cinna Dog Biscuits have only a tablespoon of peanut butter...just enough to taste. Go here for the recipe. These soft baked Peanut Butter and Jam Dog Biscuits are made with fresh pureed strawberries. You'll find the recipe here. One of the pups in our Bodacious Community had dental surgery requiring the removal of several teeth. After the surgery, she was no longer able to eat our homemade crunchy biscuits. I created a Bodacious Soft Baked Peanut Butter Dog Treat. It's almost identical to our original. Here is the recipe. 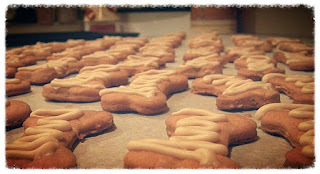 All of our kids loved our Homemade Apple, Cheddar & Cinnamon Dog Treats! They're easy to make and take no time at all! Here is the recipe. The inspiration behind this scrumptious, soft baked homemade dog treat was the abundance of fruit and yogurt in our refrigerator. I used cantaloupe, strawberries, and blueberry Greek yogurt, but you can switch it up. Here is the recipe. These soft baked homemade dog treats are loaded with shredded apples and carrots with a touch of peanut butter. You'll find the recipe here. Ground chicken breasts were on sale this week so we stocked up! The first thing I did was create a meaty treat for the kids. Here is the recipe for our Homemade Chicken And Carrot Meatball Dog Treats. For Willa's 1 Year Gotcha Day, I made Chicken And Carrot Cupcakes With Mashed Potato Frosting. This was a great alternative because Willa can't have a lot of sugar. They're super easy to make. Here is the recipe.